Kirk Bell March 8, 2017 Comment Now! A few days ago we learned that the forthcoming Lamborghini Huracán Performante had set a new lap record for a production car of 6:52.01 on the 12.8-mile Nürburgring Nordschleife. At the time, we knew only a few details about the car, including the fact that it has active aerodynamics and more power than your average Huracán. Now we know the rest of the story. 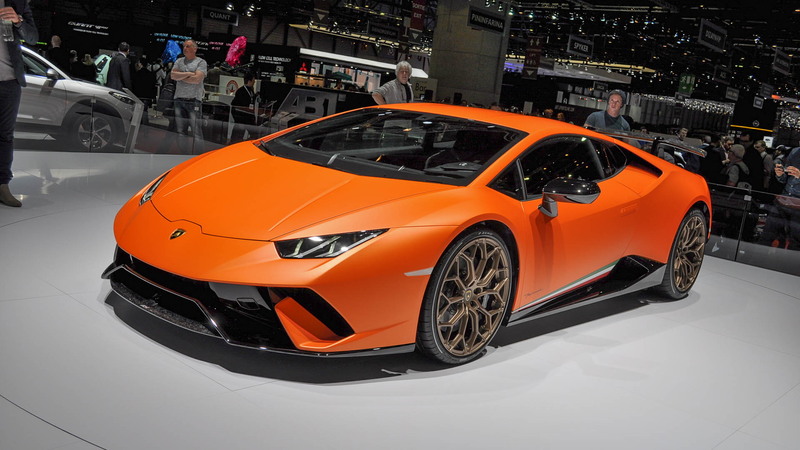 At the Geneva motor show, Lamborghini unveiled the lightweight version of its V-10-powered supercar. The 5.2-liter V-10 in the Huracán Performante is amped up to 640 horsepower at 8,000 rpm and 442 pound-feet of torque at 6,500 rpm. 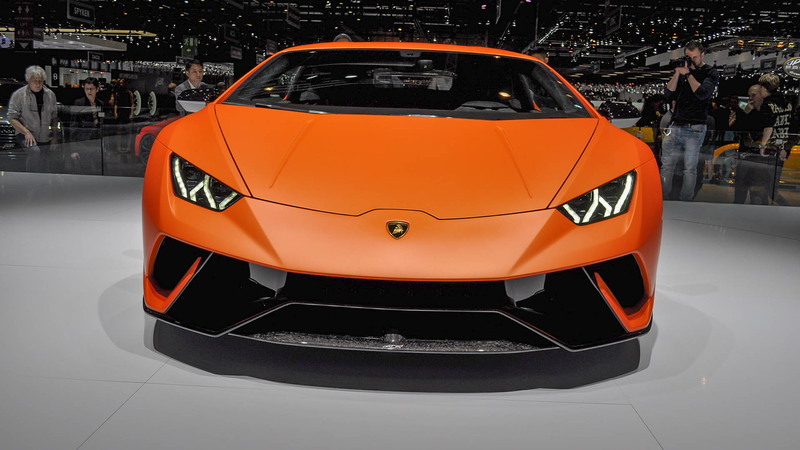 However, Lamborghini is likely quoting metric horsepower, so that figure would be 631 in the United States. 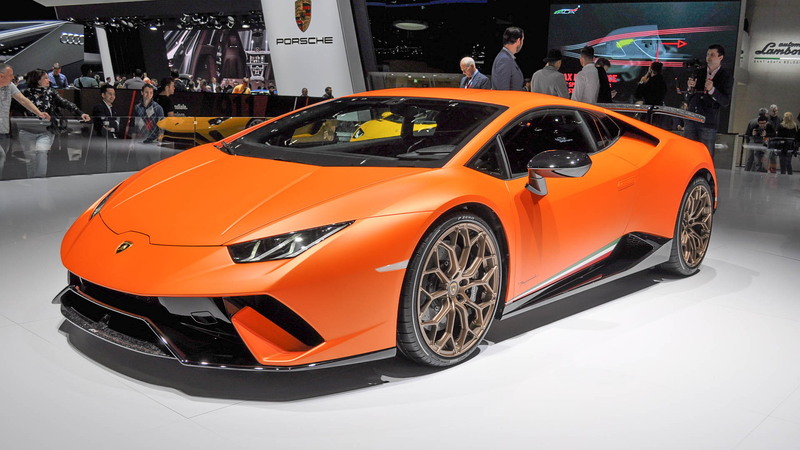 Lamborghini says 70 percent of the torque is available at a mere 1,000 rpm. Upgrades to the engine include technologies taken from Lamborghini's motorsports program. The fluid dynamics of the intake and exhaust have been optimized. New titanium valves allow higher valve lift, and the exhaust system has been redesigned to reduce both weight and back pressure. On top of the engine is a bronze manifold that recalls previous special edition engines such as the powerplant in the 30th anniversary Diablo. The 7-speed dual-clutch transmission is optimized to deal with the extra power, and the car uses Lamborghini’s permanent four-wheel drive system, which is a fifth-generation Haldex system with a mechanical self-locking rear differential. All that power comes with extra performance. Lambo quotes a 0 to 62 mph time of 2.9 seconds, a 0 to 124 mph time of 8.9 seconds, a top speed of more than 202 mph, and a 62 to 0 mph braking distance of 101.7 feet. A lot of effort went into cutting weight to improve the car's performance as well. The body is based on a hybrid aluminum and carbon fiber frame. The carbon fiber is a forged composite that uses chopped carbon fibers in a resin to create lightweight, complex geometrical shapes that can't be made with traditional carbon fiber composite materials. The additional forged composite components on the Performante include the front and rear spoilers, engine cover, rear bumper, and rear diffuser. All told, these parts contributing to a weight loss of 88 pounds. The total dry weight is 3,047 pounds, and the weight distribution is 43 percent front, 57 percent rear. 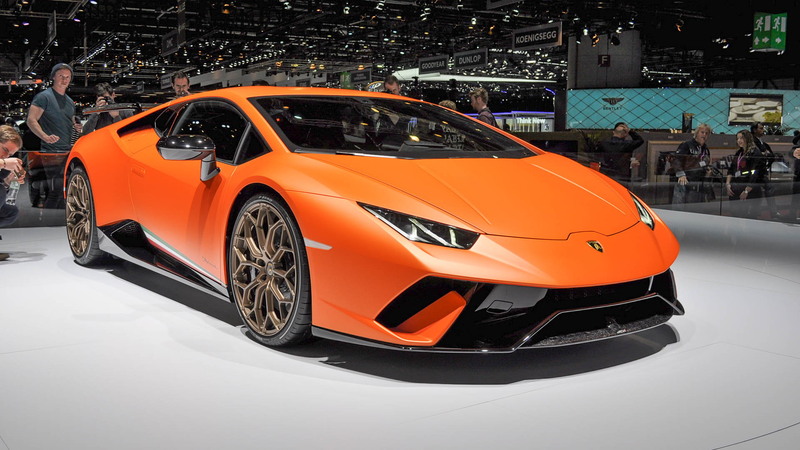 Perhaps above all else it's the active aerodynamics, the so-called Aerodinamica Lamborghini Attiva (ALA), that allowed the Huracán Performante to break that record at the Nürburgring. This system allows the car's aerodynamic elements to vary between high downforce and low drag. The front spoiler has active flaps that close to create downforce and open to direct airflow to reduce drag. The flaps can activate in less than 500 milliseconds. The rear decklid is designed around the air ducts to the rear wing as well as the wing pylons. Two central ducts always stay open for cooling, while two others are connected to the inner channels of the rear wing. The air flow through the rear wing channels is controlled by two electro-actuated flaps. When these flaps are closed, the rear spoiler acts like a fixed rear wing with 750 percent of the downforce of a Huracán coupe. This enhances cornering and braking stability. When the flaps are open, the air flows through them, reducing drag, and increasing top speed. Lamborghini notes that this system is 80 percent lighter than a traditional hydraulic system. But wait, there's more. The rear wing’s inner air channel is split right and left, and this allows aero vectoring for high-speed cornering. The system can direct the air to either the right or left side of the spoiler, increasing downforce and traction on the inner wheel, and thereby counteracting the load transfer. Lamborghini says this optimizes the chassis’ momentum, requires a reduced steering angle, and improves the car’s overall dynamic stability. Of course, the suspension is modified, too. The springs and bars are 10 percent stiffer, the radial and axial arm bushings are 50 percent stiffer, and Lamborghini says roll stiffness is up 15 percent. Passive dampers are standard and magnetorheological dampers are optional. The steering is electromechanical, with variable ratio steering optional. Both versions have been recalibrated to to be more responsive and to offer more feedback. The tires are Pirelli P Zero Corsas developed specifically for the Huracán Performante. A second tire, the Pirelli Trofeo R, is also available, and that's the tire this car used for it's record-breaking Nürburgring run. Lightweight forged Narvi 20-inch wheels sit at all four corners. Braking is performance by ventilated and cross-drilled carbon ceramic discs clamped down upon by 6-piston calipers at the front and 4-piston calipers at the rear. The active aerodynamics components are noticeable because they are left in a gloss, naked carbon fiber finish. But there are more exterior changes than just that. The front fascia is completely changed below the car's beak-like nose. The front end has no grille, and the outer air intakes of the base car have given way to one large dark, ominous opening that is the home of the active front spoiler. Along the sides, the rocker covers and their air intakes are matte black instead of body color, the mirrors are gloss black, and the wheels are painted bronze. The rear of the car is dominated by the large rear wing. The air intakes are integrated into the engine cover, which has a Plexiglas window. The exhaust outlets are mounted higher than on base cars, and the rear diffuser is matte black. Inside, the Huracán Performante has a lightweight theme. The air vents, shift paddles, door handles, and center console are created from forged composite. The upholstory is black Alcantara, including on the standard sport seats. Comfort seats are offered as an option. The driver is treated to an active aerodynamics graphic on the dashboard display; it shows when and how ALA is working, including the aero vectoring function. The driver also has new configurable digital displays that change depending on driving mode. This system supports Apple CarPlay, and the Lamborghini telemetry system, which records driving performances for playback and study later. All of this comes for a price of $274,390, plus destination. Interested buyers can go through the Lamborghini Ad Personam Program to personlize their cars as well. Look for the first deliveries this summer. For more from the Geneva motor show, head to our dedicated hub. Why can't production cars reach 300 mph?